The presented room availability, rates and discounts are actual and final for all our 176 hotels in Penang. A major part of spots of tourist attraction on Penang island is concentrated on the territory of the capital of the island George town. However tourists should not limit the exploration of the destination to the boundaries of the city as other parts of the island keep as well many spots of tourist interest. George town boasts numerous beautiful architectural landmarks, temples of ultimate glory and many other landmarks of world significance. The Penang Bridge is one of the main symbols of the island connecting the island with the continent. The total length of the bridge is 13.5km being the third in the world by its length. Tourists should take a tour over the bridge as it offers unforgettable panoramic views being a perfect background for memorable photos of a journey. 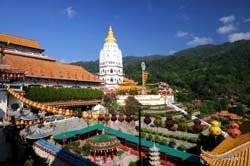 Among religious landmarks of the destination the Snake Temple is one of the most interesting objects to visit. The temple is remarkable not only for its unique architecture. It is mentioned in numerous legends. According to one of the legends the temple was erected on a place of a priest’s house. The priest was a man of boundless kindness and turned his house into home for all poor and helpless people. The priest was that kind that even let snakes into his house. Tourists can witness a genuine miracle happening each year in the temple. During the Buddha holidays lots of snakes slither into the temple.